The first of a two-part series by FCW Columnist Margaret Harding on her once-in-a-lifetime trip to India last October, the article explores India’s urgent need for more electricity—and why nuclear energy would have a significant positive impact on India’s people, democracy and economy. The column was originally published in FCW #493, Oct. 18, 2012. Thanks to the support of Fuel Cycle Week, I spent four days last week in Mumbai, India, including two days participating in the Indo-U.S. Nuclear Safety Summit. This was my first trip to India, and I was excited to be going there. While I’ve spent too many hours in airports and on jets to be overly enamored of travel for travel’s sake, I do enjoy the opportunity to see a new place and experience a new culture and meet new people. India is one of those exotic places of my childhood. As an avid reader, I gobbled up Rudyard Kipling and dreamed of seeing those places first hand. More recently, the film “Slumdog Millionaire” brought India back again to my attention. Sadly, many of the dramatic scenes of that movie have their foundation in the true condition of Mumbai’s streets. All of this is a background to some comments about India’s nuclear energy program and why it is so important to the government as well as industry. AND why it is should be important to the people of India as well. 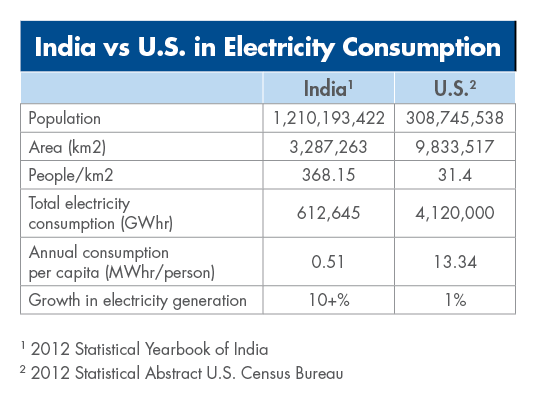 The table above right provides some stark comparison of India vs. the U.S. in population, land area, and electricity consumption. Even allowing for the inordinately high consumption in the U.S., India has a long way to go to achieve some reasonable level of electricity consumption for its population. 500 Kwhr represents less than 4% of the U.S. average. The U.S. is roughly twice the consumption of Europe which puts India at about 8% of the average European Union per capita rate. Even for basic human services like refrigeration, lighting, and sanitation, India has a long way to go to bring sufficient capacity across the nation. Currently blackouts of 8-10 hours routinely occur in parts of the country. Manufacturing and other industrial or technology sensitive employment cannot function in such an environment—directly affecting jobs and standards of living. To bring capacity to even 50% of U.S. consumption rates requires that India install an additional 8,072,000 GWhr of generation per year. With high capacity nuclear, coal, or hydro that means 921 GW of new plants (roughly 600 large LWRs). Land requirements for high density nuclear minimize the impact on population and encourage more industrial development. India’s drive to be included in the world’s civilian nuclear program speaks to this issue. Indian nuclear leaders recognize the need to operate safely and to develop and use common technologies with the rest of the world. Their desire to build and operate large LWRs of the latest vintage for safety and security demonstrates this even further. Consider that the Kundankulam reactors were started several decades ago, but mothballed as India developed and built its own PHWR technology. Their indigenous reactors are relatively small and India’s lack of ability to work with the rest of the world due to proliferation concerns slowed their progress. Recognizing they need more power more quickly than they were able to develop it internally, India has begun to reach out to the rest of the world. The opportunities for growth in both the U.S. and India related to the expansion of India’s nuclear fleet are significant. We need to continue to develop robust relationships to encourage safe construction and operation. Getting even a dozen new nuclear plants would have a significant positive impact on India’s economy creating a positive spiral of opportunity, employment, and economic development that would turn this sleeping giant into a Bengal Tiger.